A good-night tour of body parts for the mildly sleep-resistant. McNeill’s text incorporates a simple mindfulness technique of first noticing, then consciously relaxing each body part to help energetic toddlers slow down enough to fall sleep. Seven perky tots recall their activity-filled days before toddling off to bed. The formula is simple. First there is a question: “Are your toes getting sleepy? 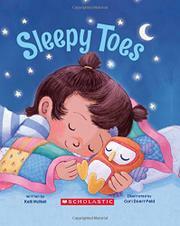 Very very sleepy?” This is followed by a description of activities: “All day long they wiggle along—wiggly, wobbly toes.” The final stanza for each body part tells readers, “now it’s time to get some rest,” then reinforces that suggestion, ending with a rhyme. Accompanying illustrations show each pajama-clad child growing progressively quiet and relaxed. Doerrfeld’s palette is bright and cheery. Although the toddlers have different hair and skin tones, all have the same wide eyes and persistently sunny dispositions. They are evenly split, three coded male and three female, with the gender of one being unclear. Activities shown are not limited by gender roles. The only brown-skinned child, a girl, has two fuzzy pigtail puffs.